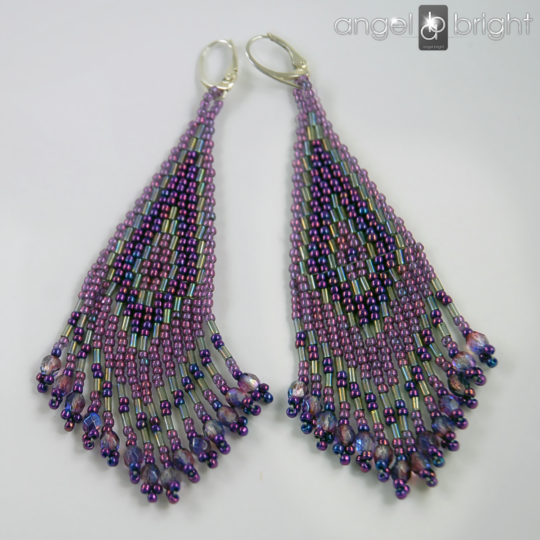 Very impressive, extraordinarily, slender, Boho style earrings in purple and silver shades. Carefully braided with tiny Toho beads and fine Chech crystals. Extremely impressive and shiny jewelry !!!! MATERIALS: Chech crystal beads, oval glass crystals, tassel viscose in purple, TOHO beads in violet and dark silver colors. English earwires – sterling silver. MEASUREMENTS: 8,5cm without earwires. EXTRA OFFER: We offer earwires to choose from: open earwires and closed English (shape like in the picture). Earrings can also be ordered on clips. Please let us know in a message during purchasing the product. 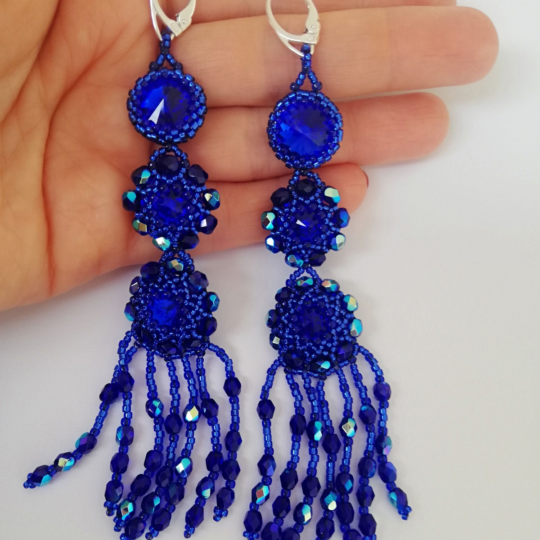 Very impressive, extraordinarily, slender, Boho style earrings in blue and silver shades. Carefully braided with tiny Toho beads and fine Chech crystals. Extremely impressive and shiny jewelry !!!! MATERIALS: Chech crystal beads, oval glass crystals, tassel viscose in cobalt, TOHO beads in blue and silver colors. English earwires – sterling silver. MEASUREMENTS: 8,5cm without earwires. EXTRA OFFER: We offer earwires to choose from: open earwires and closed English (shape like in the picture). Earrings can also be ordered on clips. Please let us know in a message during purchasing the product. Very impressive, extraordinarily, slender, Boho style earrings in silver and gray shades. Carefully braided with tiny Toho beads and fine Chech drops. Extremely impressive and shiny jewelry !!!! MATERIALS: Chech drop beads, oval glass crystals, tassel viscose in silver gray, TOHO beads in dark silver and graphite colors. English earwires – sterling silver. MEASUREMENTS: 8,5cm without earwires. EXTRA OFFER: We offer earwires to choose from: open earwires and closed English (shape like in the picture). Earrings can also be ordered on clips. Please let us know in a message during purchasing the product. Very impressive, extraordinarily, slender, Boho style earrings in pink and silver shades. Carefully braided with tiny Toho beads and fine Chech crystals. Extremely impressive and shiny jewelry !!!! MATERIALS: Chech crystal beads, round glass crystals, tassel viscose in fuchsia, TOHO beads in pink and dark silver colors. English earwires – sterling silver. MEASUREMENTS: 8,5cm without earwires. EXTRA OFFER: We offer earwires to choose from: open earwires and closed English (shape like in the picture). Earrings can also be ordered on clips. Please let us know in a message during purchasing the product. 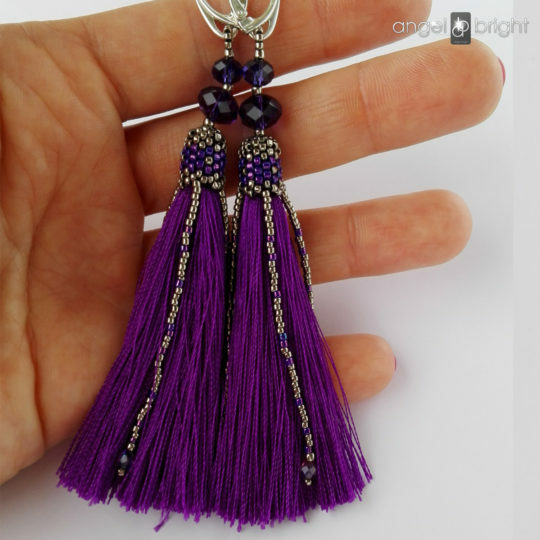 Very impressive, extraordinarily, Boho style earrings in violet - gray shades. 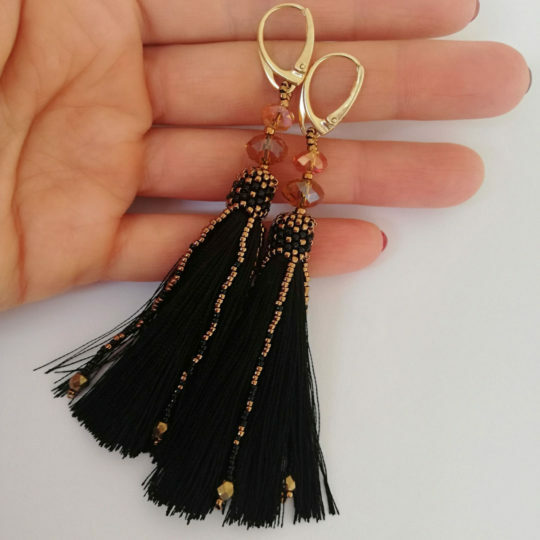 Carefully braided with tiny Toho beads and fine Chech crystals. Extremely impressive and shiny jewelry !!!! MATERIALS: Chech crystal beads 4mm, TOHO beads in pink, violet and graphite colors. English earwires – sterling silver in earrings. MEASUREMENTS: 10cm without earwires. EXTRA OFFER: We offer earwires to choose from: open earwires and closed English (shape like in the picture). Earrings can also be ordered on clips. Please let us know in a message during purchasing the product. Very impressive, extraordinarily, Boho style earrings in silver - gray shades. 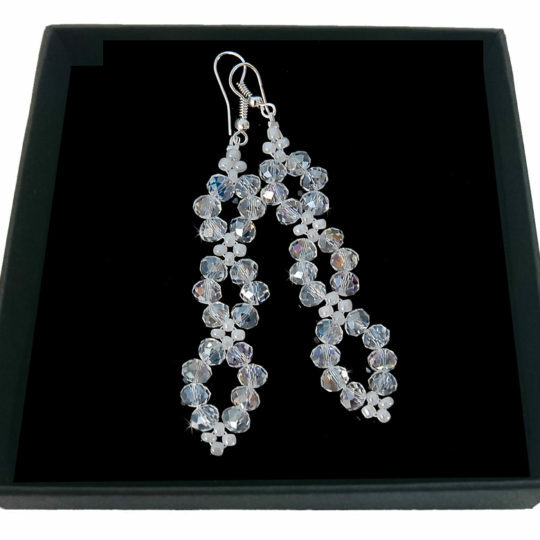 Carefully braided with tiny Toho beads and fine Chech crystals. Extremely impressive and shiny jewelry !!!! MATERIALS: Chech crystal beads 4mm, TOHO beads in pink, violet and graphite colors. English earwires – sterling silver in earrings. MEASUREMENTS: 10cm without earwires. EXTRA OFFER: We offer earwires to choose from: open earwires and closed English (shape like in the picture). Earrings can also be ordered on clips. Please let us know in a message during purchasing the product. Very impressive, extraordinarily, Boho style earrings in graphite and pink shades. Carefully braided with tiny Toho beads and fine Chech crystals. Extremely impressive and shiny jewelry !!!! MATERIALS: Chech crystal beads 4mm, TOHO beads in pink, violet and graphite colors. English earwires – sterling silver in earrings. MEASUREMENTS: 11cm without earwires. EXTRA OFFER: We offer earwires to choose from: open earwires and closed English (shape like in the picture). Earrings can also be ordered on clips. Please let us know in a message during purchasing the product. 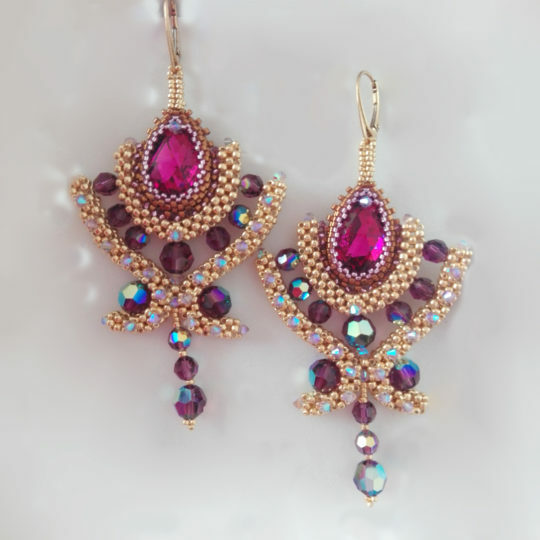 Very impressive, extraordinarily, Boho style earrings in red and gold shades. Carefully braided with tiny Toho beads and fine Chech crystals. Extremely impressive and shiny jewelry !!!! MATERIALS: Chech crystal beads 4mm, TOHO beads in dark red and gold colors. Open earwires – gold-plated silver MEASUREMENTS: 11,5cm without earwires. EXTRA OFFER: We offer earwires to choose from: open earwires (shape like in the picture) and closed English. Earrings can also be ordered on clips. Please let us know in a message during purchasing the product.